We've come to the end of our brief look at how to begin notebooking in your homeschool. I know I have painted in broad strokes. But if truth be told, the best part about notebooking is that there is no ONE way...or RIGHT way. Feel free to take the thoughts I've shared these past few days, keep what you think might work for your family, and scrap the rest. GUILT FREE...knowing that your notebooks will be as unique as the children creating them. 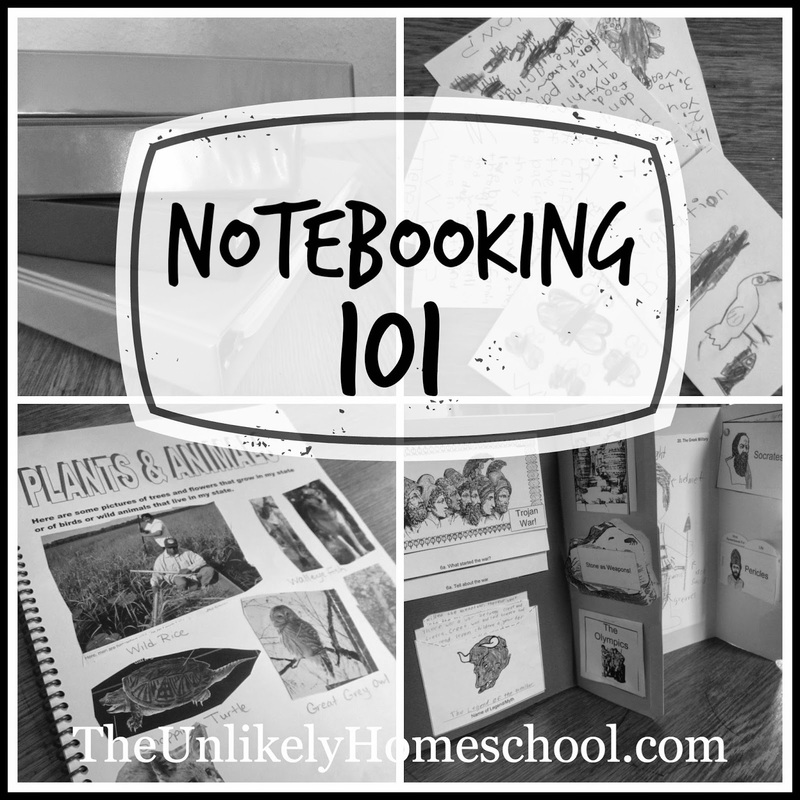 While I have tried to give a basic outline of what a notebook is and includes, I know there are many who want to know what notebooking looks like in the REAL WORLD OF HOMESCHOOLING. You know...the world of children who don't always want to do their work...of houses with little to no storage space for dozens of 3-ring binders...of toddlers who insist on wiping their peanut butter and jelly hands on the nearly completed notebook page that happens to be sitting on the dining room table. What does notebooking look like in THAT world? Here's my best answers for these and other REAL WORLD notebooking questions. When do you start notebooking? Don't limit notebooking to just your reading/writing aged kids. My 3-4 year old preschoolers have each made alphabet notebooks that have served as a way to compile all their completed ABC pages. As my kids get older (kindergarten-second), they begin forming opinions and an ability to recall specific details about what they have learned. However, they aren't always physically capable or willing to write large portions of narration on their own. At this stage, I allow them to dictate their thoughts to me as I write their words down on a notebooking page. As they mature physically and have more hand-eye coordination for lengthier periods of writing, I write their dictated thoughts down on a dry-erase board (word-for-word as they say it) and instruct them to copy what I have written onto their notebook page. This simple copywork-style writing helps to gently teach basic writing mechanics (capitalization/punctuation) and spelling. By around third grade, I expect my children to be able to notebook independently. I, of course, always look over their work and make grammar/mechanics suggestions when necessarily. But, other than that, I remain HAND'S OFF. It's their notebook. It's their responsibility. What subjects do you notebook? While the "correct" answer is that you can notebook for ANY subject, I prefer to keep our notebooking efforts to content-rich subjects like history, science, geography, and creative writing. Somehow notebooking about participial phrases during grammar or algebraic equations in math just doesn't garner the same enthusiasm. That being said, many folks choose to make an all-in-one notebook with a division for each subject being learned that year...including grammar and math. How often do you notebook? Where do you store all of the completed notebooks? Since my preferred notebooks are the small, singular-topic type, I can easily store most of the completed notebooking projects inside a manilla envelope that I tuck into our annual portfolio. As I have very little shelving space in my tiny, cottage-style house and only three small closets, our annual portfolios and any larger notebooks are stored in plastic storage tubs in our basement with the rest of our currently-not-in-use homeschool materials. It is not ideal, but it works for the time being. Thankfully, many of our larger (composition or 3-ring binder size) notebooks have been used from year-to-year and have never had to be put away. We store them in our homeschool hutch along with all our other in-use books and supplies and refer to them often. What kind of notebook is best for a beginner? Without question...a nature notebook! These simple sketch book-style journals, in my opinion, are the easiest...NO RIGHT OR WRONG WAY...kind of notebook there is. While you can certainly do some narration in a nature notebook, most of the pages are filled with sketches, rubbings, and real life samples of nature. Each of my kids have a nature notebook that he/she began in preschool. They continue to add to these same notebooks throughout the year and from year to year. Here's a peek at how we use our nature notebooks NATURALLY. What if a child doesn't like to write? I've got one of those. Actually, I've got two. But, that doesn't deter me from whippin' out the notebooking supplies. I just have to always keep in mind that a notebook is PERSONAL. I have to allow each of my children to recount learned material in his/her own way. For my daughter, that involves lengthy portions of narration with lots of BIG FLOWERY WORDS. For my oldest son, it means a few simple labels and many...many...many pictures. That's OK. Either way proves competency. Shows mastery. Provides review. In his typical fashion, landing somewhere in the middle is my middle son who has a lot of words to say but doesn't like the physical act of handwriting. But, who says a notebook has to be handwritten? While he is still young, I am more than fine writing out his thoughts as he dictates them to me. If he still clings to his handwriting aversion when he gets a bit older, I will probably encourage him to type out his narrative portions to be cut out and glued into the appropriate places in his notebooks. Why major on the minors? A type-written notebook is still a notebook of personal thoughts and reflections, is it not? Generally, there are two camps of notebooking mommas. Those who use a big red pen to identify mistakes in a child's notebook and those who do not. I join ranks of the latter. In my opinion, a notebook should be a child's best effort...no sloppy or shoddy work...final drafts only, please! But, if mistakes are made in spelling or grammar or whatever, I might point out the errors to my child and discuss with him/her how it SHOULD HAVE BEEN written affording an opportunity for a change to be made if applicable, but I never mark in his/her notebook. A notebook should stand as a showcase...a finished product...the best of the best for THAT child at THAT grade level. While it might not be perfect, a notebook will act as a model of progression...a visual reminder of improvement from year to year. Obviously, the grammar/mechanics used in a first grade notebook will be much-less polished than that of a seventh grade notebook. Nothing is more deflating to a child who just completed a notebooking masterpiece than to see the markings of a big red pen scribbled all over it. When reviewing a completed page, praise accurate content and leave the grammar-police badge at the door. Notebooking has always been a treasured piece of our homeschooling days. But that's us. That may or may not be you. While I think it is a great method and tool for learning, it is one of many great tools. If you have a child who just doesn't seem to get jazzed about making a notebook, dismiss this die-hard notebooking diatribe and find what works best for you and your homeschool. In other words, don't let notebooking be the hill you die on. Some kids love it and some kids hate it. As a momma who still holds a fond place in her heart for the notebook she made in Ms. Isaac's first grade class many...many...many moons ago, it's easy for me to love notebooking and foster a passion for it in my homeschool. But, as an eclectic-a-la-carte momma, I also know that it takes different strokes for different folks. Go with grace and find the best method and tools for you and yours even if your choices are light years away from what I'd use. Thank you so much for the notebooking wisdom, Jaime! 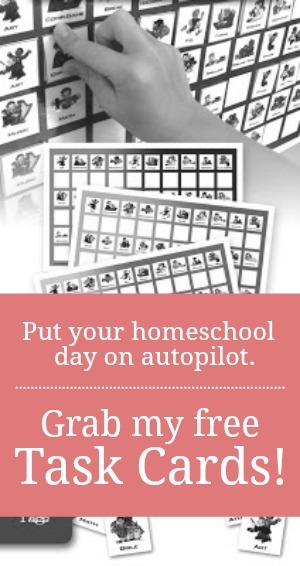 I have heard so much about it and have thought it sounds amazing to implement in this, our first full year of homeschooling, but I haven't been sure what it "is" exactly or how it looks in "real life". But now I feel so confident given all the info and links you gave and, of course, the gobs of wisdom the Lord will have to impart on me over the coming school year. Thanks for bolstering my confidence about making notebooking part of our family's DNA. Blessings! You can do it, Krista!. Baby steps. Remember that every notebook will look different. Just start with something small and ease into it. Have a great school year! Great Notebooking posts, Jamie! Thanks! Thanks! BTW...We got a letter a few weeks ago, but will wait until our first day of school (end of August) to write back. What a fantastic and detailed blog post, thank you! I was wondering about those kids who just want to do bare minimum - listen to the book about Greek life, narrate back or answer some questions, then call it good! But I want him to notebook about it. And he would just rather get onto the next subject so he can finish school for the day! Do you have one of those? How have you introduced it into your day and then enforced it too? I know this is a few years old, but I am glad I came across it. Very helpful information! Do you require your children, particularly the middle & high school age, to work in notebooks on a certain subject everyday? Or a certain number of days weekly? Thank you! No. I don't, Amy. Some days, there's more to notebook about than others. For instance, we are in the middle of reading a longer book about the Tudor reign in England. Today will be our fourth day reading it. We will create a notebook page about it when we're all done with the entire book.